Lois is one of the many artists who participated in the Whidbey Island Arts Council, Open Studio Tour (Sept 25th and 26th). She presented beautiful photos with an impressionistic twist printed on canvas in steel frames, made by dbBrad. Some of the canvas was sealed and hung outside on the metal screens. Her art and the rusty corrugated screens are quite a wonderful combination. We also put some 'trim' on the yard. The landscaping was never supposed to be part of the house remodel we did last year but, due to groundwater, a landscape plan by Fran Abel, and improvements to how the house relates to the land, we added it to our scope of work. The pond still needs a little work around the edges. We'll use rocks, plants and wood to shape the stream and hide the liner. 50-100 tour visitors are expected to stop by most studios which will be great exposure for all the artists, and for dbBrad. When we installed a French drain to mitigate a small stream which ran inside the perimeter of her crawl space all winter. Part of this was from surface water, but most of the water is from her own roof. When we tore off the old poison asphalt torch down roof and insulated a new, installed metal roof, we decided we could no longer dump this water onto the street (day light tight line is Island County standard water control) where it would just run down to the sound. View from Deck off Lois's bedroom. We also saw just how much water was generated from the roof so decided to make a pond. It was never intended to be a Koi pond but habitat for wildlife was our second objective to retention. 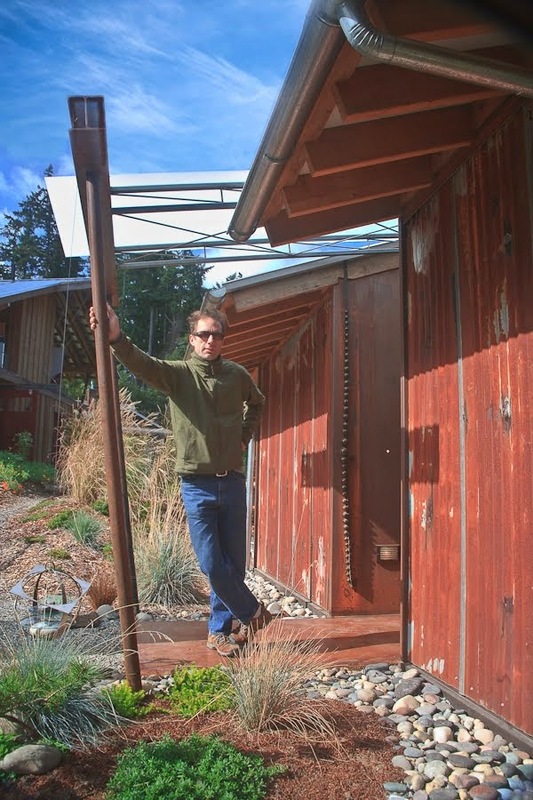 Because of the minimal grade and the surface water we also made a collector stream that receives downspout water and yard water along the entire edge of the house. Lois' pond has continued to evolve, but slowly. With very limited funds we've nursed the project along with an hour here and a few rocks there. But a lot of liner was still showing so we spent a lovely half day in the warm rain of early fall rearranging rocks and plants we had on hand to 'pretty up' for the art tour. We didn't finish and don't have nearly enough plants or rock, but it will look looks much better for the art show and most of the liner is hidden/protected. 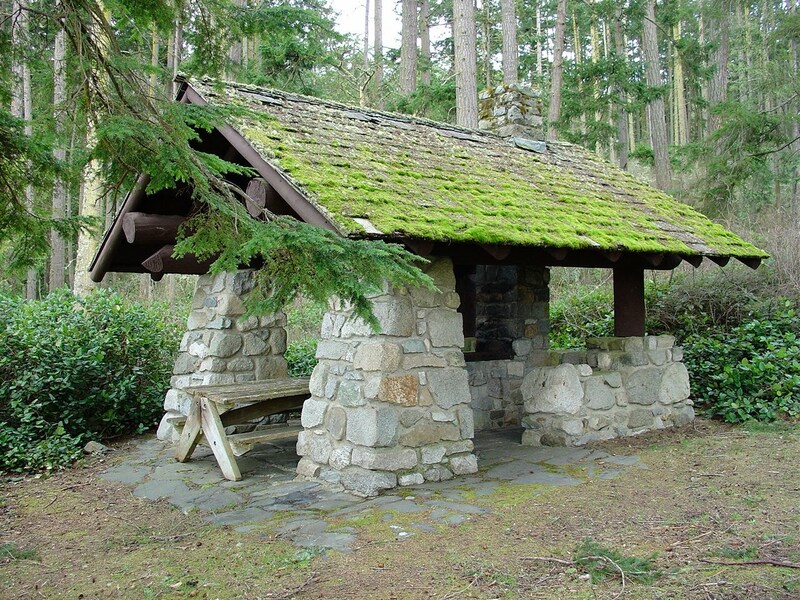 This Deception State Park shelter, showing its age, was just restored by a group of volunteers. Lex Palmer and Brad Hankins double check the log layout. To keep the tapered log level on the ridge, we layed out marks on each end based on a level line reference which was the same on each end from the log's top. Here the bottom of the log is up, so we can cut it. Having the natural checking of the log within our cut zone should help relieve the internal stresses of the log and prevent splitting over time. Carrying the shorter of the two ridge pieces up to position. The gaggle of shelters, walls, trails, ranger quarters, and more, that were built at Deception Pass State Park by the CCC's are a valuable national asset and a wonderful part of the Washington's state park system. When visiting Deception Pass State Park be sure to visit the CCC museum. The Park ranger, with gun and Kevlar vest, provided us with parts and tools and even a little help! I find it incredulous that over the last few decades this nation has spent billions on road expansion and, as consumers, we have purchased trillions of dollars of trinkets, most of which are already in a land fill. Yet we cannot find the dollars to maintain beautiful old historic buildings. Brad Hankins of dbBrad plunge cutting the log ridge cap. Fortunately, talented, motivated and concerned individuals were willing to give up every weekend for 3 months to help see that the building was fixed. Detailed and problem-solving by Harrison, with many other jumping in to complete the project, this is the final weekend of work. I feel honored that I got to put on the last piece! The ridge cap, the crown!! Here we're getting the 400 pound roof cap from the ground to the ridge. The ropes around the log were our safety lines. We mostly rolled the log up the ropes to the top. The trickiest part was removing the rope from under the log ridge cap. These people gave up every weekend for 3 months to help restore this roof. If this shelter isn't worth maintaining, we need to ask our selves what is. How our nation keeps growing and spending and supporting a disposable lifestyle and not maintaining our old and significant infrastructure makes no sense to me. However I am in the minority, albeit a growing, minority, as indicated by more than one person calling me a greenie. I wear that label proudly! When I go to box stores and watch people buying, I sometimes feel like I'm on another planet. But there are people, like the ones I worked with on this project, who care deeply. They make donations of time, tools, expertise and money. With their generosity this marvelous shelter at Cranberry lake was restored so that it may be used by park visitors for decades to come. First Street in Langley becomes the race course for the Soup Box Derby every September. Years ago there was a restaurant in Langley called the Soup Kitchen which sponsored the first races thus the name Soup (not soap) Box Derby. It didn't happen for many years and was revived almost a decade ago and continues to grow into a great family event for the comunity and every racer walked away with a trophy and a smile. And the crowd? Well, they were a happy lot. 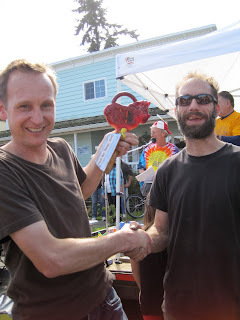 The two finalists were the Mukilteo Yacht Club Racer, second place, and The Pigeon Racer, first place. The Mukilteo Yacht Club racer, coming from across the water, placed second. Built to soup box speck and shaped in a wind tunnel, it was the expected winner to be. But The Pigeon Racer here with Brad Hankins and Jimmy Cussen was the winner! Jimmy and Brad's first team effort ends with smiles and success. Jimmy and I have teamed up to make a car. Here it is in front of his shop. We were considering an electric motor run by two batteries and a solar panel and actually driving the cart to race day in Langley, 3 miles away. Limited turning radius and LPD would prohibit this. The cart was truly design built. We started with a wood beam and two bicycles and a few sketches. We cut up the bikes, bolted the wheels onto the beam. When we saw problems developing we detailed a solution which always took our design down a slightly different path from doityourself to creativechampioncart! Some plexi gleamed from the dump gets fashioned into a windscreen. Joe of FBI studios will be creating some graphics for our cart. Jimmy and I will both be down at the pits early Saturday, with tools, to help fix any problems other carts may have so we can have a fun safe race day for all! Special thanks to helpers like Michelle, Helo and Thom and Gracie. Without their help we may not have finished projects like the single lever for both back brakes. The alpine lakes wilderness between highway 2 and I-90 is one of the most amazing, desolate and dramatic places I've had the opportunity to backpack in. These pictures are from 7 day trip in late August that was cut short by 2 days because of snow, rain and generally un-fun weather conditions. This picture may be the best one of the trip and was the first one I took! Arriving fairly late in the evening, the setting sun to the west was lighting up the hills to the east and casting a wonderful light turning the clear, cold blue water to a solid warm orange. Not only was the light amazing but this Island is one of the most architecturally perfect sculptures I've ever seen. Joe Greene navigates some steep granite. This granite had amazing holding power making it possible to step on a 70 degree face without slipping. Of coarse coming down is always a bit harder requiring greater care in foot placement. Tucks pot with fresh snow above. An amazing snag. The tree next to it is probably several decades old making me wonder how old and majestic the tree/snag must have been in it's prime. Probably hit by lighting as even in it's decapitated form it's the tallest thing around. Miss Goat was quite interested in my Gorp. Hoping to earn her keep she went from rock ledge to boulder, peering over the edge at us offering wonderful posses. She followed me back to camp alternating between grazing licken off the rocks and giving us that endearing look willfully asking for a slightly more substantial meal. So tempting but all along I could see the ranger saying 'Don't Feed the Animals' and we didn't. Eventually she left. Granite mountain with freshly frozen slush, no longer easily passable changing our back country plans to summit and exit via the valley on the other side. Smallest of Robin Lakes with a steam that seams to drop off to no where. Architectural rocks placed by a non licensed architect! The biggest and oldest tree around. Over three times the size of anything near by. Somebody once said to me while watching me sort through a pile of scrap lumber to be burned, extracting the most amazing pieces, that they finally figured it out. 'Brad really loves wood', they said. It's true and I do, in all forms, but especially when still living. Joe Greene trucking through the woods. Joe Greene tying a fly late in the day, making a nice negative space with Cathedral peak. Parting shot of primary foliage along the Cle Elum river with Cathedral Peak in the background.